Leading Wholesale Trader of digital insulation tester meco dit 954, 15 kv high voltage insulation resistance tester 7015, rish insulation tester insu 10, waco analog insulation tester metal body, waco motorized analogue motor driven insulation tester and fluke digital insulation tester 1503 1507 from Mumbai. 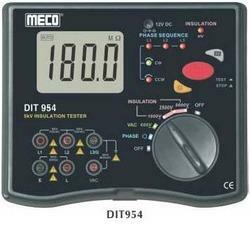 MECO DIT 954 is a 5KV Digital Insulation Tester with 3½ Digit (1999 Counts) Large Display and Backlight. It measures Insulation upto 200G ,AC Voltage upto 600VAC and checks Phase Sequence and Phase Status. Inbuilt Protection Circuit to prevent the harm of reverse Voltages. Measuring 30 Insulation Test Voltage Ranges. 13kV, 13.5kV, 14kV, 14.5kV, 15kV. AC Voltage : 0 ~ 700V. DC Voltage : 0 ~ 1000V. Short circuit current upto 5mA. PI, DAR & Auto Hold Function. 2 Lines X 16 Characters large LCD Backlight display. 2 optical LEDs are built in for data transfer. Bargraph indicates test voltage, rise & decay can be observed. Internal memory for data storage. 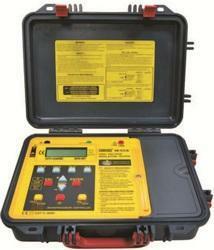 Well isolated to contact & Surge protection. Power supply : Rechargable battery. Test Voltages 50V/ 100V/ 250V/ 500V/ 1000VTest voltages from 50V to 1000V can be selected for Insulation Resistance measurement. 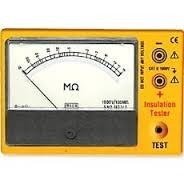 It covers all insulation tests up to 1000V. 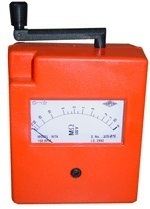 Insulation Resistance MeasurementThe instrument is capable of measuring insulation resistance from 10 KOhm ...999 MOhm. Hands-free continuity testingContinuity testing (0-10 with acoustic signal) can be done without pressing the test button. In addition to the display function, an acoustic signal can be activated which sounds if the adjustable limit value is violated. 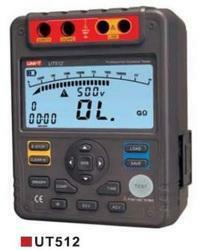 VoltmeterInstrument measures voltages > 25V ... 600 V AC/DC. Automatic discharge for capacitive circuits after test MeasurementCapacitive devices under test, such as cables and windings that get charged during the test are discharged by the tester. Live circuit detectionDisplays presence of voltages > 25V irrespective of function selected. Pre-selectable measurement time for Insulation Resistance MeasurementIn normal course, the insulation test terminates and the measured insulation resistance value remains on display for 2 sec after the test key is released. With the Pre-selectable measurement time feature, the insulation test continues and the measured value remains on the display for the pre-determined time. Pre-selectable time: 10 sec - 5 min. Pre-selectable limit checks (Go/ No-go option) for MOhmAn acoustic signal can be generated when the measured value of insulation resistance falls below an adjustable limit value. Lead resistance null facilityThe instrument provides a facility to compensate the resistance of the leads for an accurate measurement of low resistance. Storage of MIN/MAX valuesIn addition to the display of the actual measured value, the minimum or maximum value can constantly be updated or stored. Storage Memory for last 50 readingsThe instrument provides a facility to store and recall 10 values in each of the 5 ranges of insulation resistance measurement. Blown fuse indicationThe display FUSE points to a blown fuse. Stop WatchThis function allows you to measure elapsed time up to 1 hour. Auto-power off functionThe instrument turns off automatically, if any of the keys or the instrument turns off automatically, if any of the keys or the selector switch have not been activated for about 10 minutes in insulation range and 5 minutes in other ranges or can be switched to continuous operation. Protective holster for rough dutyA holster of soft rubber with tilt stand protects the meter against damage in the case of shock and drop. Low Resistances Measurement (0.01Ohm... 99.9 Ohm)Low resistances can be measured up to 99.9Ohm. There are two measuring ranges for Low W: 9.99Ohm and 99.9Ohm. 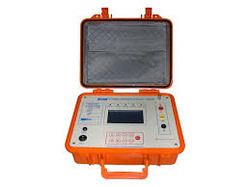 Hand drive Insulation Tester is used for measuring insulation resistances of various electrical machineries, Control Panels, Switching Equipment, Insulators Cables, Wirings and various other devices ranging from Small Electrical Units to Large size Transformers. The instrument conforms fo Is: 2992:1980. Hand drive Insulation Tester is used for measuring insulation resistances of various electrical machinery, Control Panels, Switching Equipment, Insulators Cables, Wiring and various other devices ranging from Small Electrical Units to Large size Transformers. The instrument conforms FO IS: 2992:1980. 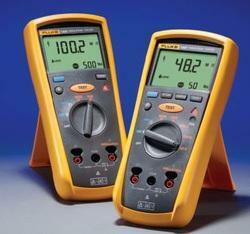 The Fluke 1507 and 1503 InsulationTesters are compact, rugged, reliable,and easy to use. With their multipletest voltages, they are ideal for manytroubleshooting, commissioning, andpreventative maintenance applications.Additional features, like the remoteprobe on these tools save both timeand money when performing tests. Short circuit current : <=1.4mA(±0.5mA). Safety category of CAT-IV 600V and CE conformity. The Motwane had been offering comprehensive range of products designed in-house catering multiple segment of power and energy sector. 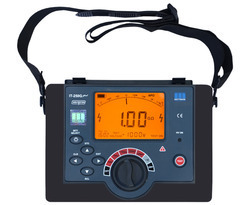 Being pioneer in insulation testing the IT250G SPOT is a 5KV voltage selectable digital insulation tester measures digitally and also in analog. It is a battery operated most compact device made to give stable and reliable performance in energy intensive area. Auto power off enhance battery life and pleasant amber backlit allows user to work in dusk environment also. It is ideally suited for many troubleshooting, installation & commissioning in electrical Substations and preventative maintenance on both domestic & industrial applications. IT 250G is an ideal suited for onsite testing. Auto discharge facility after every test. Internal Data Storage up to 1000 test readings. Battery operated with status indicator. 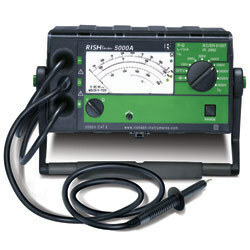 Test Voltages to 5000 VThis instrument is suited for the non-destructive measurement of insulation resistance in electrical systems, at machines and transformers and in cables, as well as within the electrical equipment of, for example, locomotives, tram systems and ocean going vessels, with eight selectable test voltages up to 5kV. Voltage measurement to 2000 VWith the voltage measuring ranges, test objects can be checked for the absence of voltage in networks of up to 2KV. This is important for insulation resistance measurement, because extraneous voltages distort measurement results. Discharge of Capacitive Devices under TestCapacitive devices under test such as cables and coils, which might be discharged to test voltage, are discharged by the measuring instrument. 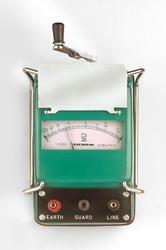 The drop in voltage can be observed at the needle gauge. 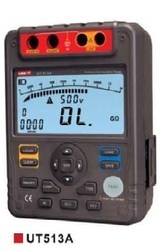 Measurement in accordance with EN61557 part 1 and 2/ IS 2992 (VDE 0413)Measuring current is equal to 1mA at a test voltage of 100V, 250V, 500V and 1000V. Measurement Cables with Heavy-Duty InsulationThe measurement cables with heavy-duty insulation are permanently connected for safety and technical reasons. Possible danger caused by the unintentional removal of cables is thus avoided, for example when charging occurs due to capacitive test objects. Needle Gauge with LEDsThree LEDs arranged within the needle gauge make reading easier. The lamp lights up which is located next to the scale, which is assigned to the selected measuring range. During the measurement sequence, the green LED indicates whether or not the battery charge is sufficient for the measurement. reading of insulation resistance of electrical rotating machines, power distribution lines, communication cables, insulators , control and switching equipment etc. 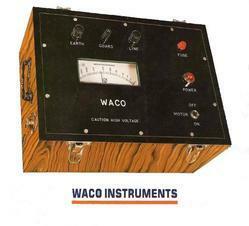 They are robust instruments, incorporating a built-in-hand driven generator and a solid-state circuit for a stabilized D.C. output. 0.02-20 Mohms Low Tension power line. 0.05-50 Mohms Communication cable, low tension power line etc. 1-1000 Mohms General Insulation Resistance Test. Digital filters function for measurements in high noise enviroment (10 s, 30 s, 60 s). MIC-5010: Continuity measurement of protective connections and equipotential bonding in accordance withEN 61557-4 with current > 200 mA. 990 cells of memory (11880 records) with the capability of wireless data transmission to a PC (with the USB-ORadapter) or through a USB cable. Power supply from main power line or battery packs, low battery warning indicator, built-in fast charger. Keyboard and display backlit (MIC-5005 - only display).The instruments meet the requirements of the EN 61557 standard. 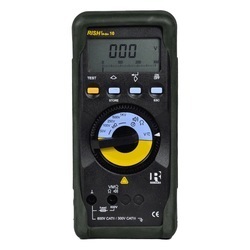 Looking for Digital Insulation Tester ?